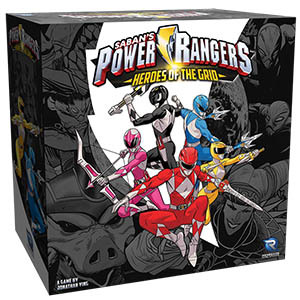 Early yesterday, Renegade Game Studios unleashed the Kickstarter for Power Rangers: Heroes of the Grid, a new cooperative board game based on Saban’s beloved series TV series. In just over 24 hours, the crowdfunding campaign has amassed pledges reaching more than $150,000 – easily funding the project with more than 22 days left. The love for Power Rangers, which first launched in the United States in 1993, obviously remains strong in the gaming community. Heroes of the Grid will provide 2-5 players a set of ability cards for each Ranger, and miniatures in the appropriate colors. The core game will also include miniature figures and game stats for Bones, Rita Repulsa, Pudgy Pig, Madame Woe, and the ever-present Putty warriors the Power Rangers must guard against. Gameplay will last 45-60 minutes, wherein players will defend sections of Angel Grove against invading villains. The game was designed by Jonathan Ying, who worked on Star Wars: Imperial Assault, Warhammer 40k: Forbidden Stars, and DOOM: the Board Game. Multiple expansions are built into the KS campaign, including Shattered Grid, which will have additional challengers from the BOOM Studios comic series, including the Ranger Slayer, Black Dragon, and Lord Drakkon himself. Another expansion, White Light, will bring in the White Ranger, increase the maximum players to 6, and call Lord Zedd to the fray. Added figures and component upgrades are planned as stretch goals, which are likely to be unlocked if the campaign maintains momentum. If you’ve always wanted to be a Power Ranger and face down nasty foes from other dimensions, you owe it to yourself to give Power Rangers: Heroes of the Grid a look. The game is expected to release in Spring 2019.